This volume swell pedal is a clone of the Boss Slow Gear SG-1, a fairly obscure effect made briefly by Boss between 1979 and 1982. It's definitely what I'd call a "specialty effect", i.e. not something you'd expect to use a lot--but what it does, it does quite well. If you're looking for a pedal steel or violin-like swell at the beginning of a note, and you either haven't mastered volume knob pinky swells or are playing a guitar with a knob placement that makes them impractical, this effect is just your ticket. For the build, I purchased a Slow Gear PCB from General Guitar Gadgets (GGG) and sourced all the other required components directly from my favorite online vendors, based upon the bill of materials posted on the GGG website. 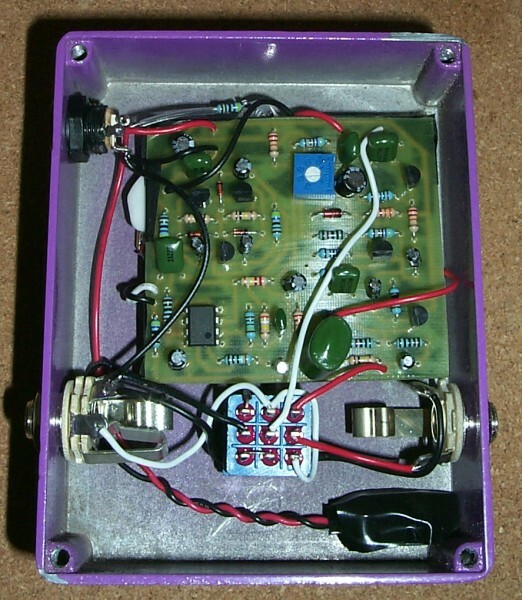 One important note--this PCB is quite large as pedal effects go, and will not fit in a standard 125B size enclosure. I housed mine in a pre-painted 1590NS enclosure purchased from Pedal Parts Plus. I highly recommend this vendor, since they offer a nice selection of enclosure sizes and will pre-paint them in a wide variety of colors. You can also buy them pre-drilled in several popular control knob configurations. And their prices are very reasonable and their service is great. For those interested in building an SG-1 clone but not wanting to hassle with figuring out all the parts to order, you have a simple alternative to my approach. BYOC offers a complete SG-1 clone kit, called the "Lazy Sprocket", which has everything you'll need in one tidy package. Price as of this writing (mid-2008) is $75. 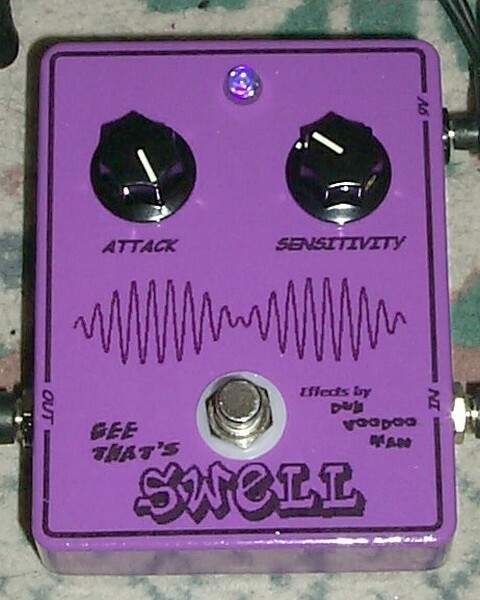 The effect is quite simple to use, with just two control knobs--one labeled "Attack", which determines the intensity of the swell effect, and one marked "Sensitivity", which determines the signal threshhold where the effect kicks in and out. There's an internal trimpot that has to be set initially to maximize the swell effect, but I found this to be fairly easy to do. It's quite a cool effect, and one that you won't find on that many pedalboards!